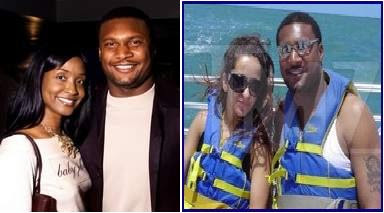 Okay, so I will admit that I’ve been following the Steve McNair murder-suicide case quite obsessively. It’s been a fascinating look inside of the most coveted yet oftentimes sordid lifestyle of a professional athlete. Money, fame, adoration, beautiful women - these guys seem to have it all from an outsider’s perspective. So when things go tragically wrong, like they did in the case of Steve McNair, you can’t help but scratch your head and wonder what was he thinking or was he even thinking at all. Gallivanting around town with a twenty-year-old who had nothing to lose, co-signing for her SUV, taking vacations with this chick with photographic evidence? All I could think was Messy, Messy, Messy McNair! I could go on all day with the numerous cardinal rules this guy broke, like DON’T CHEAT ON YOUR WIFE, but today I want to talk about the media and their overt disrespect for McNair’s African American widow, Mechelle McNair. Since the news hit that McNair was found dead next to his twenty-year-old Persian side piece, Sahel Kazemi, I’ve read and watched numerous news reports that have categorized her as his “girlfriend.” This struck me odd because just the week earlier and sometimes simultaneously, these same news outlets CNN, MSNBC, FOX, etc…were reporting on fellow adulterer Governor Mark Sanford and his “mistress” from Argentina. Article after article, news story after news story, not once did they ever fail to call Sanford’s other woman his “mistress.” So I couldn’t help but wonder why were these same news outlets so adamant about calling Steve McNair’s murderer his “girlfriend.” Was this because he was a professional athlete (maybe), was it because she was 16 years younger than him (could be), or was this just to belittle the marriage he had with his African American wife of the past twelve years (ding, ding ding!). Although a lot of folks don’t want to see or admit it, racism is still alive and very well in this country. And from the age of Jim Crow to the age of Obama, the one thing that racist in America have shown across the board is disrespect for the African American woman. Just look at how they tried to stereotype and categorize Michelle Obama during this past year’s election. Why do I think that the reporting on this case has a racial undertone and shows utter disrespect towards Mechelle McNair you might ask? 1. The endless reports that never failed to call Mark Sanford’s mistress a "mistress." 2. Labeling Kazemi as Steve McNair’s “girlfriend” implies that McNair wasn’t married. According to Merriam Webster, a mistress is a woman other than his wife with whom a married man has a continuing sexual relationship. A girlfriend on the other hand is a frequent or regular female companion in a romantic or sexual relationship. The BIG difference between the two, one has no mention of there being a wife. Therefore, every time FOX, CNN, MSNBC, and even the HUFFINGTON POST calls Sahel Kazemi Steve McNair’s girlfriend, they are telling the world that he did not have a caring wife at home holding down the fort and going through the same situation as Jenny Sanford and every other WIFE married to a philandering man. My total condolences go out to Mechelle McNair and their sons, they are the true victims here. Victim's of Steve's messy habits that ultimately led to his demise and victims of the leftover racism that continues to run rampant through our country, concious and subconciously.